Are you building/buying/flying an Experimental Amateur-Built (E-AB) or Experimental Light Sport (E-LSA) aircraft? Converting an S-LSA to E-LSA? Changing or adding equipment, or otherwise modifying an S-LSA? Need help with Letters of Authorization? Or maybe designing your own aircraft? This forum is the place to discuss All Things Experimental. Re: Needs Scales for W&B? As a side note, I think it is required to weigh and figure the weght and balance for an airplane that is used for 135 charter service every 5 years. I guess I'll have to take my LSA off of 135 service. drseti wrote: I guess I'll have to take my LSA off of 135 service. I was wrong, it is every 36 calendar months, and it applies to multi engine aircraft. 135.185 Empty weight and center of gravity: Currency requirement. (a) No person may operate a multiengine aircraft unless the current empty weight and center of gravity are calculated from values established by actual weighing of the aircraft within the preceding 36 calendar months. (2) Aircraft operated under a weight and balance system approved in the operations specifications of the certificate holder. MrMorden wrote: If you know the weights and arms of your changes, you can do a recalculated W&B without weighing the airplane again. Since that is an acceptable method to the FAA, I'd always take that option over weighing. When they get re-weighed, airplanes often mysteriously gain weight, whether from tools &supplies forgotten in the airplane, an "optimistic" original factory weight, or just accumulated dust and grime. If you calculate the weight, you will be sure you are only adding the weight of your changes. If you get the scales out and they show a bunch of added weight, you are stuck with that number. I would not expose myself to that possibility if I could avoid it. Scooper wrote: Andy, the gross weight of the '63 172D is 2300 lbs, not 2450 lbs, but you're right about 15 pounds not being that big a deal. The problem is that with all the changes I made, I didn't know if it was 15 lbs or 50 lbs, and trying to calculate it would have been more complicated and less accurate than simply weighing it. Here are the before and after photos, but there's lots of stuff you can't see (autopilot computer and servos, heavier "Real Gaskets" pushrod tubes on the O-300, etc.). For sure, as I mentioned in your case the scales were certainly the correct call. My only point is that usually when the history of the airplane is well known a calculated W&B is prefectly safe. MrMorden wrote: My only point is that usually when the history of the airplane is well known a calculated W&B is prefectly safe. Under those conditions, why wouldn't it be safe? I also agree with Andy's reasoning if there are NO unknowns and you may be the original owner and have logged every change yourself. If one is comfortable with a simple calculation then go for it. 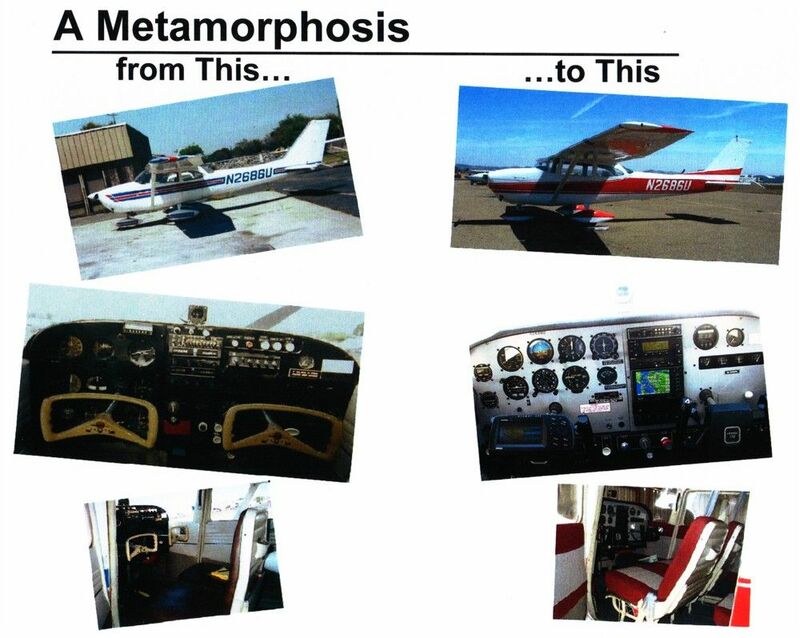 This will work just fine and the FAA is happy with this method. Since I am NOT the original owner of my plane and dont know if anything was overlooked in the log entries over the years then after all my changes and upgrades the scales were my only option. I personally feel a bit more comfortable knowing the exact weight and CG.